One of today’s most controversial topics is whether or not to vaccinate your children. It is a debate has been the subject of dozens of news specials and countless web posts. Parents today have to make a decision that parents decades and even centuries ago didn’t have to consider: Whether or not to protect their children against preventable diseases. That is the toughest question. It’s 2014, and no common parent in the United States knows how those strange, deadly diseases look. Even today’s doctors are not well versed in recognizing diseases that have been eradicated or, nearly eradicated, for generations. If it were not for the expert opinion of biological and medical professionals around the world, it would almost seem as if someone had made up these diseases just to scare people into getting vaccinated. Fortunately, there are indisputable, internationally-supported facts to back up the existence of diseases like measles, mumps, and rubella. These diseases have been around for hundreds of years and have killed billions of people. Scientists know what these diseases are (their cellular makeup), what they do, where they came from, how to spot their symptoms, how they are transmitted, and how to stop them. Those in industrialized nations who have never seen the effects of these diseases must take the word of people more traveled, more experienced and, some would argue, more intelligent than them that measles, mumps, rubella, pertussis, Haemophilus influenzae type b (Hib), and polio are, in fact, actual contagious, debilitating and even deadly diseases. This may sound like a strange argument as not many people deny the existence or the devastation of these diseases, but most people have never come in contact with them. Even so, there is little argument that they are serious, albeit easily preventable, threats. Why is it then that so many children in industrialized nations like the U.S. and U.K. are suffering and even dying from easily preventable diseases? Why have there been 19 confirmed cases of measles in New York City in the past month, and 54 cases since January 1 of 2014 of a disease that was officially declared eliminated in 2000? What happened in 2011 that caused 220 cases of measles and has produced over 450 cases since? Why are there over 3,600 cases of mumps since 2008, with over 1,000 cases in England in 2013, and 116 cases already in the U.S. in 2014? Why were nearly 24,231 cases of Pertussis (whooping cough) confirmed in 2013, including 12,000 in Arizona that November. Why 10,000 cases in England and Wales in 2012? What happened? At some point, people lost faith in the profession of public health and disease control. This is unfortunate seeing as how according to the countless trustworthy sources—Council on Foreign Relations, Pan American Health Organization, World Health Organization—public health is in jeopardy and diseases are becoming less controlled. Outbreaks within the U.S. are, for the most part, evenly spread. It is noticeable, though, that the coasts have seen more action than other regions. This illustrates recent reports of large outbreaks in New York and California. Demographics is another correlation for disease outbreak. 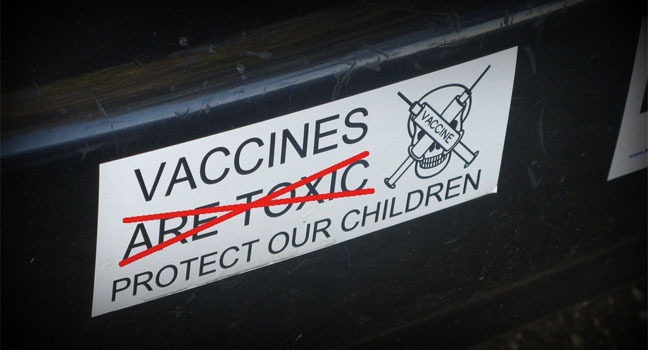 Multiple studies have shown that parents who refuse to vaccinate their children tend to be white, upper middle class, college-educated (often graduate school-educated), and hold positions of management and control within their careers. Not even a century ago, those same parents would have been on the vaccination-advocacy front lines, informing the ignorant and suspicious masses of the literal life-changer that is immunization. Today they are the (arguably) ignorant and the (inarguably) suspicious ones. In 2014, it’s hard to call someone ignorant when the internet exists to back up their beliefs. Ignorance is no longer lacking information—it is the much more subjective lacking of accurate information. Where both sides would agree is that there is a strong element of suspicion. The vaccine nay-sayers distrust more than just vaccines—they suspect those who make, administer and support vaccines. They are so wary, in fact, that just presenting pictures of children in distress makes them less likely to vaccinate—even when those pictures are of children suffering from a vaccine-preventable disease. This year, parents participating in a study conducted by the Official Journal of the American Academy of Pediatrics were presented with basic, scientifically-based messages about the factual dangers of measles, mumps, and rubella. One of these messages included photographs of children infected with the diseases. When parents saw these pictures, the misconception that vaccines have a negative side effect increased by six percent. Again, pictures of children suffering from vaccine-preventable diseases made parents suspicious of vaccines. Parents became so upset over the images of sick children that they failed to see what was making the children sick. They then resorted to the comfort of preconceived remedies that include not protecting their own children from what afflicted the photographed children. If this is not a textbook case of emotion over reason, throw out the textbook. If people in countries without significant occurrences of these diseases do not trust those whose lives are devoted to the study and stopping of disease devastation, the repercussions may send civilizations back centuries. The medical, technological and intellectual regression would be shameful. It is perfectly fine to be skeptical of the world around us. Sometimes it is incredibly necessary. It’s also normal for a parent to be cautious of what they are putting inside their child, but when making public health-affecting decisions out of fear of non-scientifically proven data, one must be ready to jump down a deep rabbit-hole of mistrust. After all, if vaccines hold the insidious evil they are said to, we better keep the kids away from any and all antibiotics (resistance). Ah, and don’t forget deodorants (cancer), indoor and outdoor allergens (asthma), lathering shampoos (cancer), and animals (maulings). Now throw in high fructose corn syrup (diabetes), radio frequencies (cancer), toys with batteries (poisoning), red dye #40 (ADHD), eggs and peanut products (anaphylaxis). However, there is also gluten (bloating), carpet (mold), drywall and insulation (asbestos), cell phones (cancer), bugs (bites, Lyme disease), fast food (poop), and restaurants (rat poop). And what’s final the nail in the coffin? Unvaccinated children. You never know what they might be carrying.